Dea apartment is an ideal accommodation for one, two or even three visitors. Bedroom interior is very modern and our guests can accommodate in one of two beds in this room or in a living room. Apartment has air conditioning, LCD TV with satellite and internet access. Kitchen is new and fully equipped with stove and refrigerator. 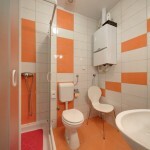 Apartment has a top quality bathroom and there is a working space ideal for business people. Interior is attractive and modern. 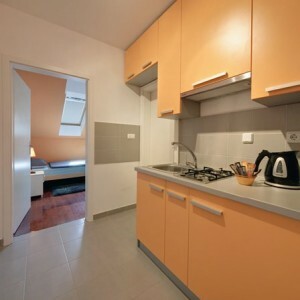 Furniture and decoration are mainly orange, red, white and black and those colors make our accommodation warm and inviting. Our guests can also use garden and they can park their vehicles at a nearby free parking. Apartment size is 33 square meters. We also offer breakfast optionally. Dea apartment is perfect for business people that plan to briefly hold in Osijek but also for those that need accommodation for a long period of time. Accommodation has all advantages of an apartment for a budget price! 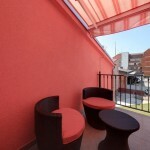 Uma apartment is an ideal accommodation for up to five people. 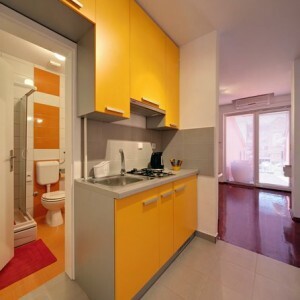 Same as in Nera and Dea apartment, bedroom interior is very modern but spacious. Bedroom has three beds and guests can accommodate here or in a living room. 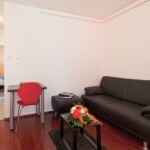 Like other two apartments, Uma has air conditioning, LCD TV with satellite and internet access. Thanks for the great service! See you again soon..